The Oppo R819 features an 8MP camera with a BSI image sensor and a 5-element lens with an F/2.0 aperture. There's an LED flash to help out with low-light shots and a 2MP front-facing camera with a wide 88° field of view. The interface is a custom job by Oppo and is very simple - too simple. There's a single screen, which serves both the still and the video camera and is cropped to 16:9, even though still shots come out as 4:3. This might make framing difficult. For controls you get the still and video shutter keys (you can use the volume rocker to snap photos), a front/back camera toggle, flash mode toggle (including fill light), along with a mode button and a settings buttons. Modes include Auto, which detects the scene, HDR, sweep panorama, rewind (which snaps several photos and lets you pick the best one), beauty shot and sunset. In the settings you can toggle geo-tagging, shutter sound and a few other settings, but not resolution - like on the iPhone, you're stuck at max resolution. Burst mode is available (just press and hold the shutter key) and will snap up to 100 photos at 5 per second. There's touch focus too. 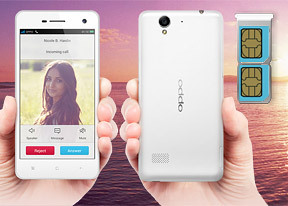 By the way, the Oppo R819 came with a Lomo camera app preinstalled. It does several effects with live preview of four of them at a time (a nice way to show off that quad-core CPU). In terms of image quality, the Oppo R819 camera is okay for an 8MP shooter, though we've definitely seen better. There's decent amounts of fine detail, though the noise reduction both leaves noise and smears out the detail in some places. Color rendering is conservative - not oversaturated and mostly accurate, though there seems to be something off about the red channel. Note that we experienced a few occasions where the R819 had missed the focus. HDR mode is available, but it's not great. It's slow to snap a photo and it doesn't align the different expositions all that good. Worse still, it really drives up the noise. It brings out a lot of detail in the shadows but does practically nothing for the highlights. The Oppo R819 may not be the best 8MP shooter around, but it gives mid-rangers a run for their money. While there are plenty of 8MP shooters in our photo quality comparison tool, keep in mind that dual-SIM phones are fairly rare. The camcorder interface is virtually identical to the still camera UI. Touch focus is available during video recording and you can snap photos too (though they come out at just under 1080p resolution, basically a screenshot of the video). Videos are shot at up to 1080p and 30fps and stored in MP4 files with about 25Mbps bitrate, some of the highest we've seen. Sound is recorded in stereo at 128Kbps and 48kHz. The high bitrate pays off - the videos from the Oppo R819 have plenty of fine detail and very little noise. They are smooth and color rendering is once again on the accurate side, save for the slightly washed out red channel. Here is a 1080p video sample we uploaded to YouTube. You can download an untouched video here - 1080p@30fps (0:06s, 21.4MB). Unlike the still camera, the 1080p video camera of the Oppo R819 is one of the better ones we've seen. There's plenty of competition in our video quality comparison tool, from both mid-rangers and high-end phones.